Adiponectin: diagnostic marker of type 2 diabetes and cardiovascular diseases. - Advanced ImmunoChemical Inc.Advanced ImmunoChemical Inc.
Home » Assay Notes » Adiponectin: diagnostic marker of type 2 diabetes and cardiovascular diseases. 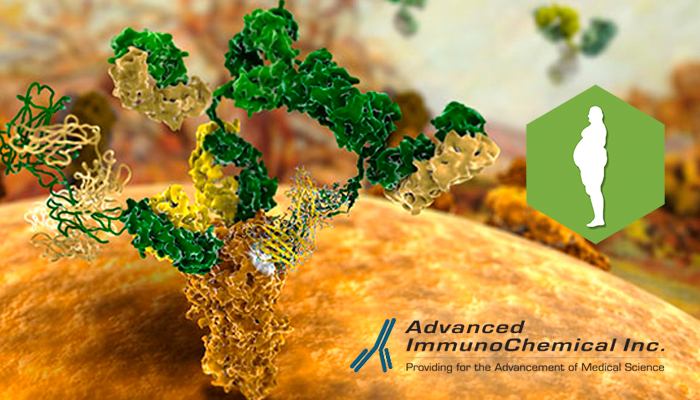 Advanced ImmunoChemical offers monoclonal antibody pairs to different oligomeric forms of human adiponectin. In addition, for calibration and assay development, we offer native purified human adiponectin for reliable, adiponectin-specific assays that do not cross-react with the closest structural homolog, human C1q. In blood, adiponectin is found as trimers (LMW), hexamers (MMW) and high order multimers (HMW) (2). The primary mechanisms by which adiponectin enhances insulin sensitivity appears to be through increased fatty acid oxidation and inhibition of hepatic glucose production. Adiponectin levels are reduced by pro-inflammatory cytokines, especially tumor necrosis factor-alpha. Adiponectin, in addition to possible anti-inflammatory and anti-atherogenic effects, appears to be an insulin enhancer, with a potential as a new pharmacologic treatment modality of metabolic syndrome and type 2 diabetes (1). The concentration of total adiponectin in the blood is approximately 3-30 μg/ml, whereas the concentration of the closest structural homolog of adiponectin, C1q, is approximately 80-200 μg/ml. Therefore, it is critical that anti-adiponectin antibodies do not cross-react with human C1q (3). (2) Wang, y., et al. Hydroxylation and Glycosylation of the Four Conserved Lysine Residues in the Collagenous Domain of Adiponectin. J.B.C., 2002, 277:19521-19529. Postscript: Kindly visit us at AdvImmuno.com to see our other clinical areas of interest.